Joseph Flynn, Ph.D., has shared a passion for a more equal world since coming to NIU in 2007. 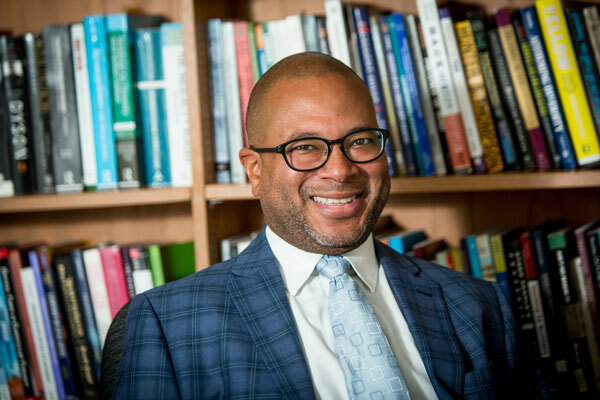 He sees his roles — as the associate director of academic affairs at the Center for Black Studies and an associate professor of curriculum and instruction in NIU’s College of Education — as creating that world on campus. Flynn’s professional focus is right in line with that, concentrating on the intersection of multicultural and social justice education, as well as Whiteness studies, media and popular culture, and curriculum studies. His work has made him a wide-ranging media expert on timely topics in education, politics, entertainment and culture. In 2018, he won the American Association for Teaching and Curriculum’s O.L. Davis, Jr. Outstanding Book Award for “White Fatigue: Rethinking Resistance for Social Justice.” That same year, the College of Education honored him with an Outstanding Contribution to Social Justice recognition for his positive promotion of diversity across campus. Flynn also debuted a social justice summer camp for educators in 2017 with his colleagues James Cohen and Michael Manderino, as well as support from the College of Education. This three-day professional development experience brings K-12 teachers and administrators to campus to help them confront and address issues of diversity in their classrooms. Flynn says he sees the students, faculty and administrators at NIU as a family that has shared in struggle and success.